For CME coordinators, preventing account issues for medical association members is much more than a remedy to an administrative nuisance. When coupled with a growing subscriber base, repetitive member account problems have the potential to virtually paralyze CME operations by overtaxing, and eventually monopolizing, tech support and staff resources. Ranging from the relatively commonplace —such as human-error at login— to system-wide fails such as membership database corruption, persistent account issues can unleash chaos throughout your association in short order, sometimes taking months (and significant financial outlay) to resolve. Regardless of their complexity, member account issues can deliver an unavoidable negative impact. Consequences might include mounting member frustration, a potential loss of subscribers and—if left unchecked— lasting damage to the reputation of your CME offerings. Preventing account issues for your medical association’s members isn’t merely a customer service issue: it’s essential to the success of your CME programming. That’s because your association members are consumers first, and learners second. A failure at a touchpoint—even if it’s as simple as a poorly designed payment page—will be seen as a failure by your association to deliver a positive customer experience. According to recent research, a learner’s perception of their user experience is an integral part of their ability to receive value from educational programming. That’s because consumers who believe that a service was designed to create the best possible user experience tend to feel a deeper connection to their provider. According to researchers, learners who view their user experience positively will have deeper engagement with their CME activities and better knowledge retention. Any hindrance to your members’ ability to easily access and utilize your CME platform registers as a strike against the overall quality of their CME experience: it impacts their view of your association, their long-term engagement, and ultimately performance-in-practice outcomes. While LMS onboarding might seem like a rudimentary exercise—providing members with basic information on how to login or subscribe to new activities—it’s actually a key determinant of how many account issues your learners will experience in the future. If you’re not using an LMS service that was specifically created for CME, you’ll have to design and manage the onboarding process yourself. This can be tricky, as recent research on learning experience design (LE) revealed that a difficult introduction to an educational platform will make learners more likely to abandon a subscription if they encounter any further account issues. 1. Design your onboarding process to offer members incremental rewards for continued engagement with the initial walkthrough. This might include offering ease-of-use tools such as content bookmarking options for LMS users or downloadable “cheat sheets” for specific FAQs as learners scroll through an introduction page. Solution: Simple cues like “Click here to bookmark this page and download our activities tracker” can encourage learners to complete a wayfinding process. Increased engagement with an onboarding process results in members retaining “how to” information longer, according to researchers, and that can mean fewer calls to tech support. 2. Empower learners to find the specific information that they need after a general introduction to the platform. Present a self-help structure that encourages member ownership of the troubleshooting process. Offer intuitive search components and a choice between support tools based on what members need to know at the moment. Solution: Don’t make your members hunt for a simple answer in a long FAQ. Allow them to type in a keyword and find a filtered list of results based on the information that they’re searching for. Provide users with a link to receive on-page help in a popup or tab that offers a quick fix without them having to leave the section or activity that they’re in. If you’ve designed and/or are managing your own LMS, you’ll have to face the inevitable question when your efforts at preventing account issues for members fall short: is it the platform, or the presentation? A simple presentation problem means that members might not be able to understand the legalese on your onboarding page, or perhaps they find the font on your activities pages distracting or hard-to-read. A design problem is a deeper issue that requires expert help. Members need a UI that is usability-focused, with a login and dashboard design that makes payment processing, account data access, and activity content easily accessible. If members are asking for help in finding your FAQ, checking progress on their activities, or completing a payment in a few steps, you’ve got a design problem. Solution: You’ll need to start from scratch and redesign your LMS, or find a third-party solution that addresses the specific needs of CME members. 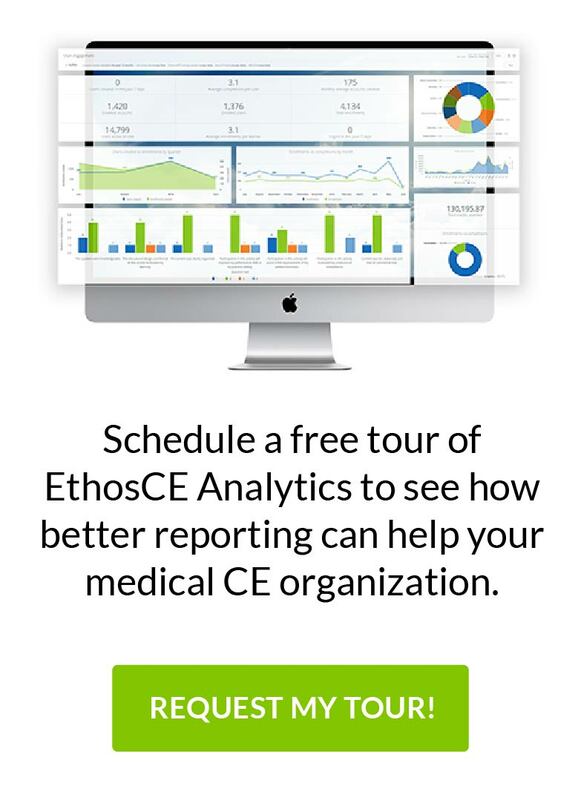 At Ethos CE, we’ve been providing LMS solutions to medical associations that help CE coordinators avoid member account issues that can compromise their users’ learning experience while helping them manage intelligent growth. Connect with us today to learn how we can transform your CME program. OptumHealthEducation.com Leverages EthosCE LMS for CME Management Is a “Software-as-a-Service” Learning Management System Right for You?